With the holidays upon us, there is not a huge amount going on in the racing world for the next few weeks. With that in mind, I will most likely spend the next few weeks ruminating on matters historical. An article on the Belair Stables Museum in Maryland got me wondering about the earliest thoroughbreds imported to the US (or, more accurately, the Maryland and Virginia colonies as they were at that time). While horses in general were obviously imported to the Americas from the 16th century (initially by the Spanish) and the 17th century by English settlers, the first horses imported with a view toward racing arrived in the mid-18th century. Governor Samuel Ogle imported stallion Spark and mare Queen Mab in 1747; the horses were a gift of Charles Calvert, the fifth Lord Baltimore – he was simply re-gifting the pair (a gesture which seems appropriate at this time of year), having received them from Frederick, Prince of Wales (perhaps best known as the father of George III). Benjamin Tasker, Jr. added to the reputation of what had become known as Belair Stud with the importation of Selima in the early 1750s. You may recall that the Selima Stakes for 2-year-old fillies on grass was named in her honor (and it seems a shame that a former G1 event, won by the likes of La Prevoyante and Shuvee, was so unceremoniously retired – see Brooklyn Backstretch for a similar sentiment about the Ladies Handicap at Aqueduct). It’s rather a change from today. Virginia was also responsible for importing the great Diomed (pictured) in 1798, aged about 21 at the time – he would become the pre-eminent sire of early American racing. But it wasn’t just the South doing all the early importation; James De Lancey in New York was at work somewhat later, but with no less influential horses. Wildair and Lath (imported in the mid-to-late 1760s) were both useful stallions, but the Cub Mare, know as ‘the Selima of the Northern turf‘ had perhaps the biggest impact. Her daughter with Wildair, Maria Slamerkin (aka Old Slamerkin) became one of the first great racing stars in New York. Their descendants include Black Gold and Nearco. 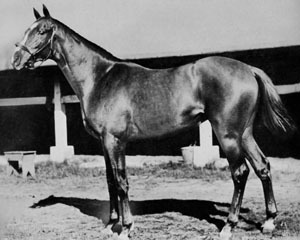 Wildair was sold and sent back to Britain where he continued his stud career when Tory De Lancey dispersed his stock. Some very interesting, if not entirely accurate, information on early American racing and breeding can be found in The American Thoroughbred, by Charles E. Trevathan, published in 1905 – now available on Google Books. Enjoy! Merry Xmas…here’s a little present relating to our fair state for you! During this period, looks like Hodgson’s Pale Ale was the joint.